Need help listing out Expenses on Invoice template. I don't know programming, and I need help modifying my Invoice template! For my time entries (e.g. Copywriting), it lists the item title and description, plus listings below for each time entry. 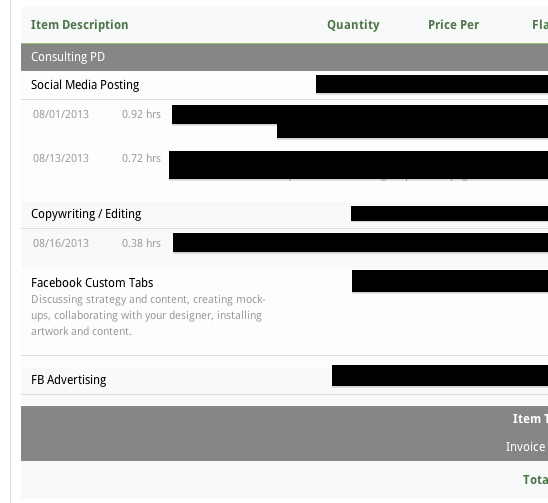 However, for expenses (e.g., Facebook Ads), it doesn't break them down individually. It just has the item title and description, and shows the total for that category. Obviously, a huge problem! My clients need to know exactly what expenses they're being charged for. How can I fix this? I tried searching in the Help section, but it just gives me a lot of programming language that I don't understand. of your templates or programming. ensure that the "show detailed expenses" checkbox is turned on. *face palm* Well, that was easy! Thanks, Seth. Diana Capella closed this discussion on 26 Aug, 2013 06:50 PM.